For those of you that read my old blog you will have seen this before. 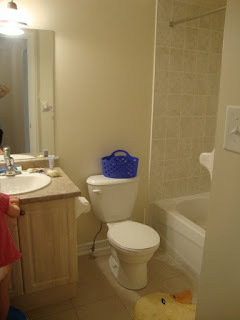 The first room we transformed when we moved in was our girls bathroom. 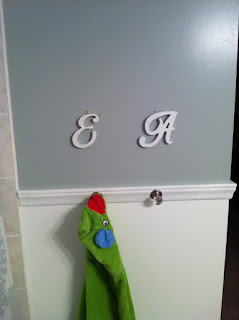 We didn't do anything major - just painting, a litle chair rail and accessorizing. Originally, I had wanted some really pretty wall paper in this bathroom that I had bought. I even had the man at Home Depot custom make the paint colour to match the wallpaper we had chosen. Once we started painting the blue I decided against the wallpaper and that I would like a clean crisp white instead. We then added chair rail with adhesive. Instead of hooks we used mini Diamond door knobs - adds such a beautiful feminine touch :) The picture hanging above the toilet is just a piece of scrapbook paper I loved in an Ikea Frame. 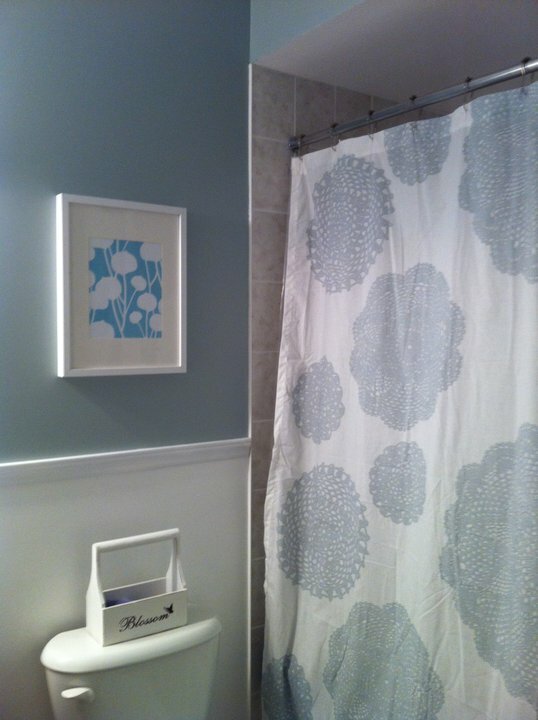 The Shower curtain is Ikea too! The white wooden letters I scored at Michaels on sale for $1 each. I still have big plans for this bathroom. When more time and money comes our way I would like to paint the cabinets whtie (Seriously Kelsey, pinky beige bathroom cabinets? What were you thinking?!?) Change the counter top to something white as well and add a custom border around the builder grade mirror!